The continuing freezing temperatures in the Britain made me think of this photo, taken back in December. 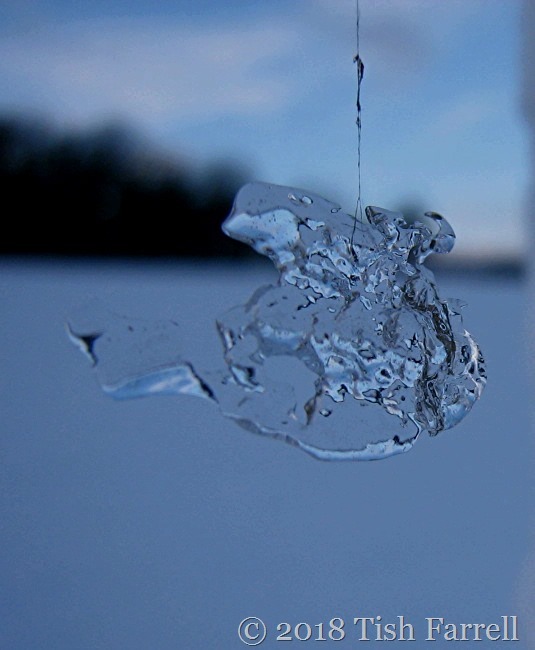 Now I have cropped and enlarged it, it looks like a Christmas Tree bauble, a piece of intricate glass. I also imagine I see a cloaked figure, a woman I think, fleeing for her life on a galloping horse. Or else it looks like a Victorian woman’s reticule, soft velvet with a drawstring closure. Or perhaps one of Scrooge’s stash of money bags. How it formed like this, suspended from a coat thread caught on a barbed wire fence up at the allotment, I have no idea. It just goes to show that we do not need to know the hows and whyfors and whats of something to see its wonder. When I found it, I thought the elements had left me a gift.